And as an added bonus, you get three postings today. I’ve got a seat staked out at McDonald’s in Dawson Creek and I’m not giving it up! Let’s go back to Denali for this one. As I’ve said, you can drive your personal vehicle into the park about 12 miles. After that you need a camping permit to get you to Teklanika where I camped for three nights. That’s 30 miles into the park. From that point on the only way to see the park is aboard one of several buses. There are green buses like I posted some time back. Basically, they’re school buses that are painted green. There are tan buses that are more like city buses and there are some buses that are white with red and blue stripes. Those white ones are run by the resorts that are located at the very end of the park road at 92 miles in. They transport their customers to and from the entrance and stop along the way to view wildlife and at the various rest stops. It’s about 6 hours from the entrance to the resorts. They typically run about $450 per night. 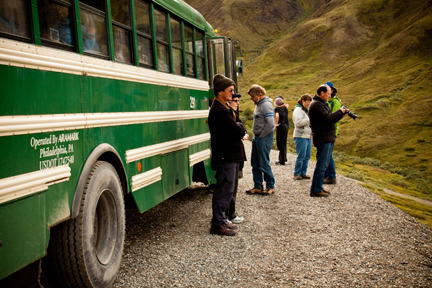 The tan buses run special tours…natural history tours, discovery tours that specialize in plants, etc., and wilderness tours that only go part of the way into the park. The cost ranges from $31 up depending on what you’re doing and where you’re going. There is also a camper bus that hauls campers to the various camp grounds. They have more room at the back for backpacks, bikes, etc. 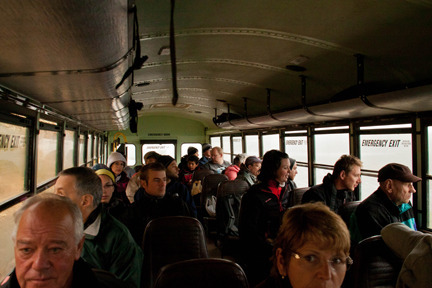 I rode the camper bus to Wonder Lake and two other green buses on separate days to Wonder Lake. Here’s a nice quiet picture of everyone looking for wildlife along the road. If someone spots something they holler…”Bear, 10 o’clock” for example and then it looks like this. The drivers are generally well informed and give a guided tour and history lesson along the way. I road with five drivers. Three were pretty good, one was like riding with Wikipedia (he talked constantly and was well-informed. Number five was a disservice to the park service. You can get off any of the green buses anywhere along the road you wish and hike away from the road. That’s what I did with to get the Reflection Pond photo. Then you hike back to the road and wait for the next bus going in the direction you want to go and hope….hope that they are a seat for you. If not, you wait until the next one comes along until you find one with space for you. 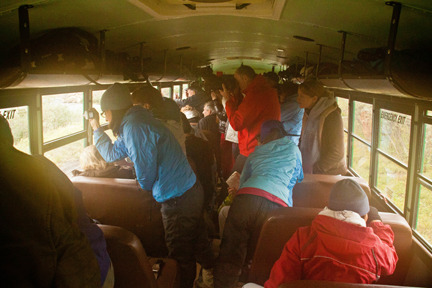 The drivers would stop as quickly as was possible at a wildlife sighting. You could open the windows for better shots and just about everyone tried to share window space on opposite sides of the bus. You could not get out of the bus! There was an exception to that rule, though. You could exit when the driver or passengers requested a landscape shot…like a good location to see McKinley or a mountain range, for example. At first I didn’t think I’d like this bus idea but if you consider that when I shot the bear encountering the wolf that I posted a couple of days ago. While I was shooting my shots, there were four additional buses in front or behind us. With 44-52 passengers each that 250 people. If they’d all been in private cars at an average of 3 per car, that’s 80+ cars lined up. I believe the National Park Service is trying to give all of us the ability to see nature in the wild and I think this works. We’ve all heard horror stories of traffic jams in Yellowstone. I think Denali has avoided that. I also believe their bear policy has saved lives by not letting bears become acclimated to food handouts. How many times have you seen pictures of happy, smiling faces as people fed bears from their cars in Yellowstone? One day, one of those bears may kill or maim someone. I believe Yellowstone has changed that policy and no longer permits feeding the animals. You can still camp in the backcountry of Denali. You have to get a permit for whichever of the 43 regions within the park you intend to hike into. You are required to carry a bear vault to store anything that has an odor….food, perfume (I put mine in a bear locker at the campsite) toothpaste, lip balm, chewing gum, etc. Most of the campgrounds have vault toilets. That is a glorified outhouse. It’s a toilet setting over an open container much like a port-a-potty. A few have flush toilets. Well, it’s about time for the dinner rush here so I guess I’ll give up my seat and head on down the road.